I participated in my first fine arts festival the last weekend in May. It was an opportunity to learn from accomplished artists about booth displays. One of the tips I went home with was that I should have a small section of my booth set aside for some photos of how and where to hang art quilts. I spoke with several artists who have a variety of large and small paintings. They shared what I have experienced, that people often don’t understand about size and scale when hanging art in their homes. They have trouble figuring out what size art they need for a particular space or maybe think all art must be centered on a wall. And maybe a combination of small pieces would work too. A few photos can go a long way in showing potential customers how to hang their art so that it compliments and enhances room design and décor. A large quilt almost filling a wall on a stairwell landing. 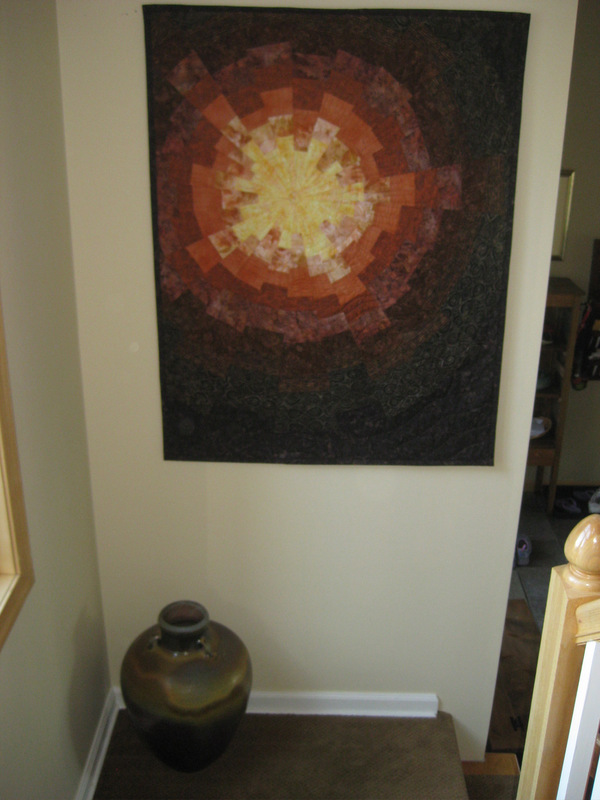 This placement creates wonderful visibility of the quilt as you descend the stairs in addition to a place from which to view it up close and in person on the landing. 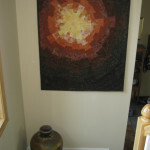 It is also visible in the living room which is off to the right of the photo. 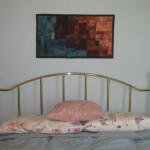 All large quilts do not need large walls. 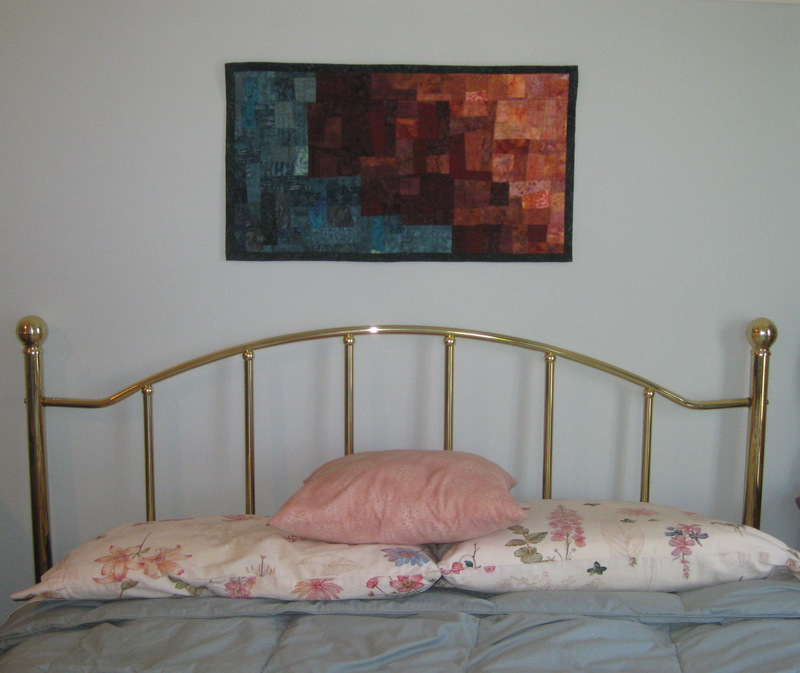 This is an example of a smallish quilt above a queen size bed where the proportions work. The size works here because the bedroom is in a space above our garage with knee walls so the wall behind the bed is only about five feet high. Normally I would suggest a quilt 26″ x 40″ at minimum for above a queen bed in a normal 8′ ceiling room but this is a situation where small is better. Here is a photo of a quilt hanging almost tight against an adjacent wall with a large mirror in our master bathroom. I love the reflection of the quilt which amplifies the colors in this very neutral room. There are no rules that say art must be hung in the middle of spaces but I think people need to see photos to understand the options. 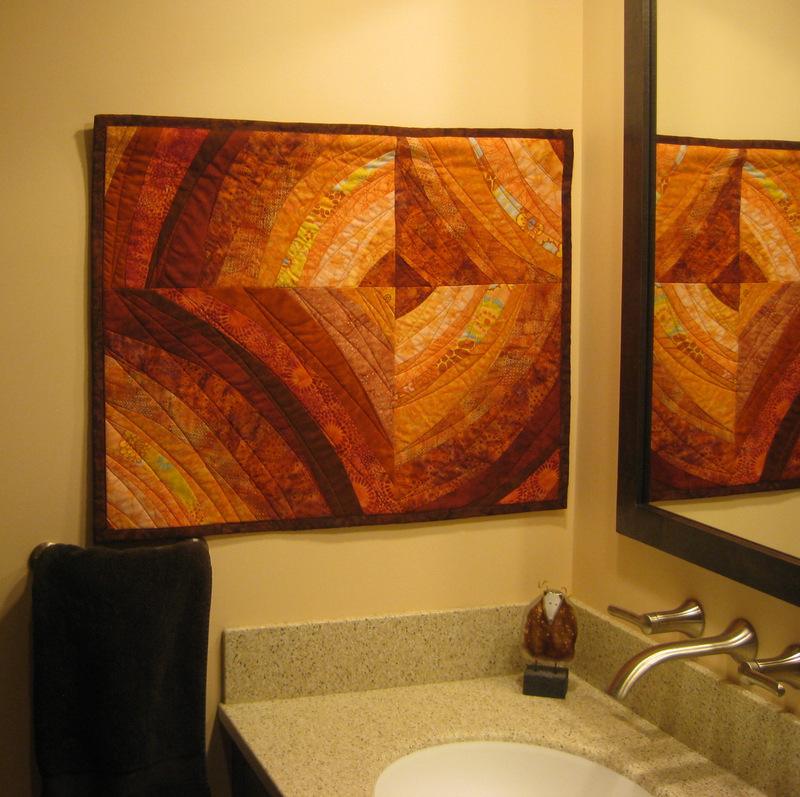 I am always reminding people….”Don’t forget the bathroom!” for art quilts! They deal with the moisture perfectly. This bathroom also has a larger quilt hanging beside the bathtub. We will see if this addition to my festival booth is a marketing bonus or not at my next arts festival in Eagle’s Mere, PA in August.